There isn't much to do on an island in Cambodia. The generators go off around 5 a.m. signaling the end to the luxury of your bungalow's fan. The island inhabitants start to climb out of bed around 8 a.m. and the day begins anew. Eat breakfast, swim in the ocean, eat lunch, nap in a hammock, read a book, eat dinner and then retire to your bungalow. Repeat. As I swung on a striped hammock of my own, I began to think of the life lessons one could learn from a few days on a remote island. From the sand crab Sand crabs dart along the shore, burrowing in holes and chasing each other away. They race away from the waves most times, avoiding a major drenching. Sometimes though, an adventurous crab allows the wave to crash and wash it toward the water and then back up the shore again. It relaxes into the experience and seems at peace with the change of pace. The sand crab who rode the wave never seemed worse for the wear. Life lesson: allowing ourselves to ride the waves of life, while perhaps uncomfortable, won't make us any worse off and we just may have some fun. This crab needs to learn to chill out from his sand crab cousins. From the Gatorade bottle A woman walks along the pier after disembarking from the speed boat. She's carrying a half-drank Gatorade and accidentally drops it and watches it fall into the water. She laughs and continues to walk off the pier and onto shore. She doesn't look back to the bottle that is now floating underneath the pier. A half-day later, the bottle surfaces near Dave while he's swimming and he proudly retrieves it and brings it to the garbage can on shore. We've yet to stop talking about her nonchalance at putting another plastic water bottle into the ocean. Life lesson: your legacy, whether good or bad - small or large, will follow you. 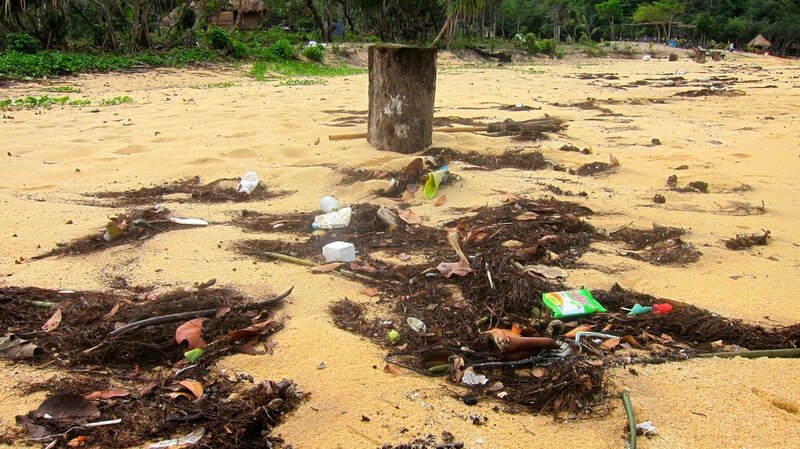 A large amount of trash washes ashore on the island after the storms. From the ants Our first bungalow is a cute, small one room structure with a mattress on the floor covered by a large mosquito net. The slats of the floor expose some of the earth below and our bathroom is outside through a sliding door. A can of bug spray sits on the floor of the room and as I pick it up to move it, I notice them. The ants. They're everywhere. It's a remote island so I'm not expecting a bug-free environment, but these ants aren't giving up. They watch their friends get sprayed or swept out of the room and still they continue to come back. After two nights of watching ants crawl all over our things, we give up and move to the more expensive, better enclosed bungalow. Life lessons: persistence pays off (for ants). Pay up if you can afford it (for people). Our bungalow shared with our ant friends. From the storm clouds The clouds roll in and we watch the storm progress from a light drizzle into a windy thunderstorm. We see the dark clouds moving toward us and know we are in for some rain, but don't anticipate that we'll be spending the entire evening in our little room unable to leave because of the lightning, wind and rain. A stashed bottle of wine in our backpack gets pulled out and we play cards by headlamp light. A knock on our sliding glass door is one of the resort staff members in a poncho and headlamp of his own taking our dinner order so he can run dinner over, keeping us dry and cozy in our bungalow rather than wet and soaking in the outdoor dining area. A tall tree blows over in the wind and we soon realize the downfall of having an outdoor bathroom on an island - but when you gotta go, you gotta go. Life lesson: you can't fight nature. Bonus life lesson: always bring a bottle of wine with you. Repairs from the fallen tree damage. From the resort host She has a 6-year-old son who lives with her parents in a province five hours away that is a major tourist destination. He lives with them in order to attend school. When we ask why she doesn't live there since there are plenty of tourism jobs, she says there are too many people there and nothing to do - it's boring. It takes us a few minutes to respond since we look around and see a total of 8 people on this island with nothing to do but sit and relax or maybe take a kayak out for an hour. Later we see her running into the water with a 3-year old boy who lives on the island. She's laughing, splashing around and smiling from ear to ear. We get a small glimpse into what she means. Life lesson: someone's idea of excitement may not always be our own, but who are we to judge? From the 3-year old We hear "hello! hello! hello!" as we start to leave our room in the morning. It's Wout, a 3-year-old with the brightest smile and best personality around. Although he doesn't speak any English besides hello and bye, we've kept him entertained by coloring, skipping stones and laughing at his dancing. And he's kept us entertained with his laugh, hand-twisting waves and his excitement over every boat that comes to shore. Dave has nicknamed him "Gangum" because if he's not wearing his Gangum Style t-shirt, he's wearing his Gangum Style flip-flops. He's the most redeeming part of our island experience and what we look forward to most when we wake up each day. Life lesson: A consistent smile and a friendly wave is still a great way to make a new friend. An intense breakfast coloring session. I'm rarely one for a beach vacation. I prefer to be active and worn out after a long day of hiking or biking rather than in a constant state of blurry eyes from alternating between napping, reading and swimming. Our trip to Koh Kong Island was so opposite of what we would normally do that on the first day I wondered how we'd keep ourselves busy for four more days. My biggest lessons learned - time actually goes by quickly when you can lay in a hammock and listen to the waves crashing all day - and pure relaxation is really good for the soul. I'm incredibly refreshed, ready for our last week of volunteering and truly excited about the next phase of our adventure. Yes, it is a hard life but someone has to do it. A busy day on the island.